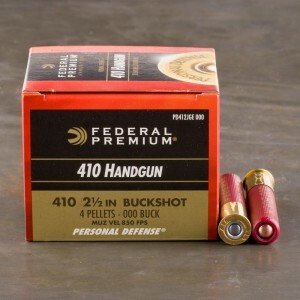 410 Buckshot ammunition is loaded with much larger pellets and is intended for larger game or self defense. 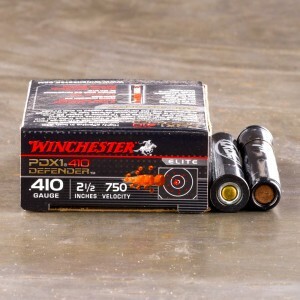 It is usually used on deer hence the moniker "buckshot." Shot sizes are usually given designations from No. 4 to No. 000, the latter often just called "triple ought." The most popular loading is the No. 00 or "double ought" buckshot. For comparison, a normal 12 gauge "double ought" shotshell has 8 lead pellets in it. 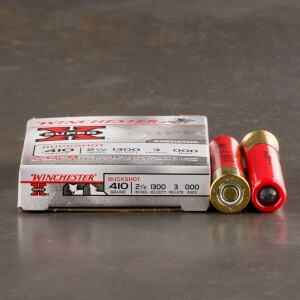 One 410 "triple ought" factory offering has 5 pellets while others are limited to only 3 pellets (a 12 gauge "triple ought" shotshell can have from 6 to 8 pellets). There are factory offerings with No. 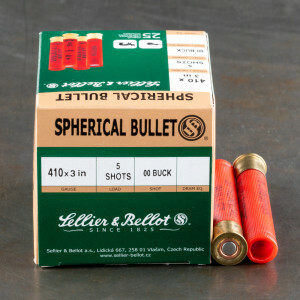 4 buckshot with 9 pellets per shell. 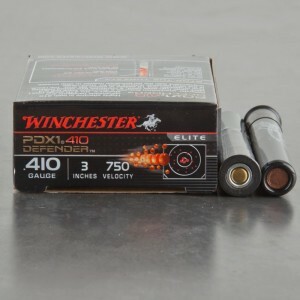 Since the case of the 410 is much smaller than the 12 gauge, it holds only a limited number of pellets making it less effective on deer sized game. However, as a self-defense or home defense round, it can be effective. There are factory offerings with a combination of a pistol slug over the top of two .35 caliber balls for use in close range home defense pistols. Exactly what I wanted at a reasonable price and could not believe how quickly it arrived at my door.